Oh Vanessa Hudgens. Where do I begin with The Hudge. I guess I'll start with saying she's my ultimate girl crush. She has been for so many years now. The actress always looks so effortlessly chic and constantly triggers serious inspiration in me. Never afraid of trying new things, V loves to experiment with her fashion choices and often pairs clothing how most wouldn't. Every April, the world awaits the outfits she wears at music festival Coachella. I've posted her outfits from the famous festival here. Seriously, there's a reason why she's called the Queen of Coachella. 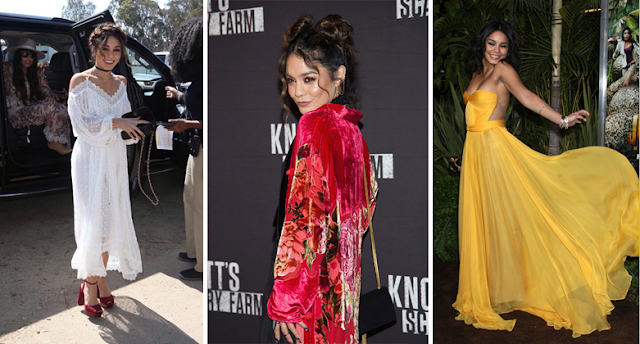 In her day to day life, however, Vanessa's fashion choices are simple yet just as boho chic; kimonos, maxi skirts, patterned trousers and floppy hats. Mixing edgy and bohemian, V basically spends her life looking like she's at Coachella. Listening to: My Chemical Romance- Kids From Yesterday. Around The World And Back.